Information shared during a poster session. “Scientists are trapped in a world [where they have to] produce, produce, produce, because their careers depend on it,” begins Melissa Rethlefsen, MSLS, AHIP, Interim Executive Director, Knowledge Management and Eccles Health Sciences Library at University of Utah Health. But the pressure of publishing has a downside. According to a June 2015 story in Science Magazine, the United States spends $28 billion every year on preclinical research that cannot be reproduced by other researchers. The study shows that more than 50 percent of all preclinical studies contain errors that limit reproducibility due to problems with reagents and reference materials (36 percent), study design (28 percent), data analysis and reporting (25 percent), and laboratory protocols (11 percent). Despite these limitations, the authors did not view that research money as wasted. Rather, they believe researchers should receive better training in study design and use only validated reagents. Rethlefsen agrees. She began organizing events to bring researchers from across the University of Utah campus together to discuss research reproducibility. Now she is reaching out to a broader audience with the 2ndannual Building Research Integrity Through Reproducibility conference to be held on June 15, 2018 at the S. J. Quinney College of Law. Registration for the conference is open and a live stream (https://www.youtube.com/watch?v=OVeUcLRWaq4) is available for those not attending in person. Listen to Rethlefsen talk about research reproducibility on The Scope radio program. Research reproducibility affects all disciplines from fine arts to genetics. Results that cannot be reproduced adds noise to an already cluttered conversation, which can degrade the public’s perception of how to use this information. 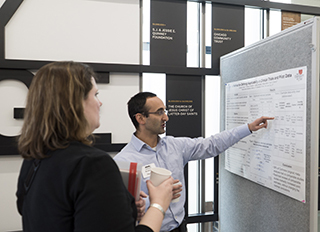 The conference brings researchers, students and administrators from across the country together for frank conversations on how to build research integrity through reproducibility. Keynote speakers will include Victoria Stodden, PhD, Associate Professor at the School of Information Sciences at the University of Illinois at Urbana-Champaign, and Ivan Oransky, MD, a Distinguished Writer in Residence at New York University's Arthur Carter Journalism Institute and co-founder of Retraction Watch. A list of speakers and panelists is available here. Stodden’s work addresses topics covering standards of openness for sharing data and code, legal and policy barriers to disseminating reproducible research, robustness in replicated findings, and scientific publishing practices.Oranksybrings his first-hand experience in academic science publishing to the conversation to highlight the weaknesses in traditional journal literature. Rethlefsen acknowledges that these changes will take time, but she believes the conference is one of many steps that are necessary to create a coalition that will change systems within the university and beyond. She credits the conference with small changes that are already moving opinion in the right direction. Last year, editors with the American Journal of Occupational Therapy rewrote their author guidelines based on content discussed during the inaugural conference that will strengthen the content accepted and published by the journal. The Eccles Health Science Library in collaboration with the Department of Philosophy at the U is also offering a four-day short course prior to the conference to examine fundamental core issues of research reproducibility and practical application of different tools and resources to improve research work flow. Registration for the short course remains open. The Eccles Health Science library is also proud to sponsor the Research Reproducibility Grand Rounds, a weekly lecture series featuring an expert who highlights one component of research integrity. While on hiatus for the summer, check out videos of past lectures. Remember to #MakeResearchTrue.